Left to right: Rick Konneker, awarded the Spirit of Coal Country Chamber of Commerce; Andy Manar, Illinois State Senator of 48th District, keynote speaker; 2016 Business of Year Awardee Michelle’s Pharmacy, Michelle and Wally Dyer; Board members: Annetta Veres, Secretary of CCCC and Mayor of Wilsonville; Mike Brill, Treasurer of CCCC; John Veres, Vice President of CCCC and Director of Wilsonville Community Outreach; Margie Brill, Webmaster of CCCC; and Judy Melchert of Hebenstreit Apartments. 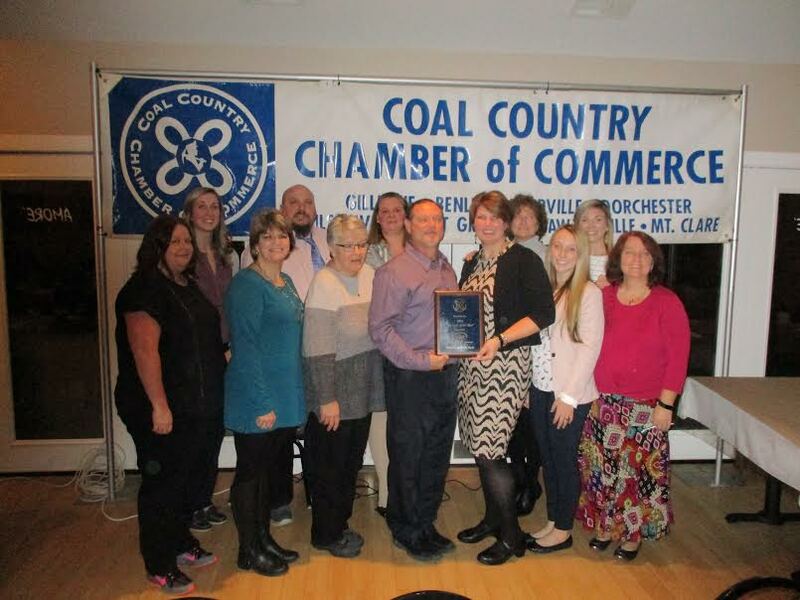 Saturday evening the Coal Country Chamber of Commerce held its 17th Annual Awards Banquet at JoDanni's Amore. During the event the Chamber acknowledged Rick Konneker with the Spirit Award for his commitment to the Choo-Choo Train. Michelle and Wally Dyer of Michelle's Pharmacy were awarded the 2016 Business of the Year award for their dedication to the communities in which they serve. 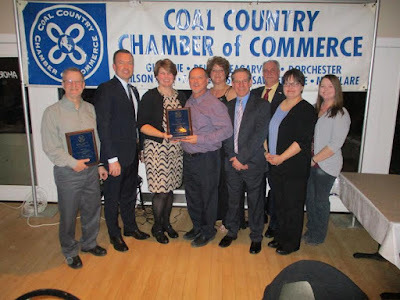 Mickey and Emmlee Robinson were also acknowledged with the Founder's Award for their long time service to the Chamber. The Chamber would like to thank Andy Manar, Illinois State Senator of the 48th District for joining us as this year's Keynote speaker. Left to Right: Jennifer Barber, Molly Bergman, Jeana Leggett, Clint Mansholt, Gwen Hampton, Sheila Cottingham Wally and Michelle Dyer, Leisha Ballinger, Marissa Woolfolk, Ashley Dicks, Marla Woolfolk.